Armed with the loft aim of making a new discovery in the business of cupcakes and to redefine them radically by making alterations in their baking style and ensuring that they taste the same as conventional cakes, Dubai's Bloomsbury luxurious store has recently unveiled an item that is being billed as the world's most expensive “edible” cupcake. The “Golden Phoenix”, as the name itself suggest is no ordinary cupcake. The exotic item was unveiled at the official inauguration function of the Dubai Mall. The cupcake commands a staggering price tag of $1223.32. The luxurious and expensive cupcake was presented on a Villari 24 carat gold plated antique tea trolley along with another 24 carat gold painted cake stand to eager sweet lovers. A more realistic approach towards preparing this cupcake stems from the fact that Bloomsbury presented the cake with the aim of keeping it edible. The store managed to avoid the trap that several exotic item makers keep falling into. 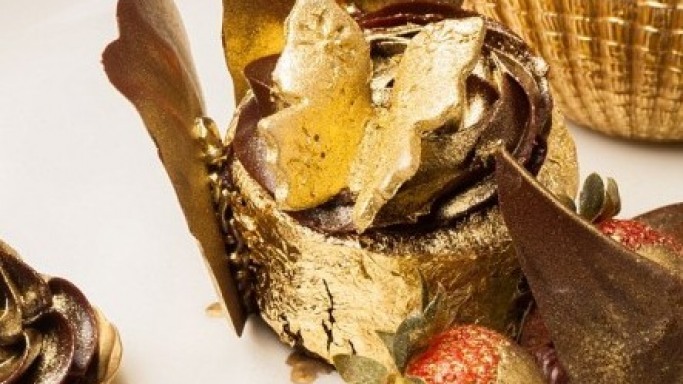 Instead of adorning the cupcake with diamonds thus turning it into an inedible food item, Bloomsbury prepared it by utilizing the finest chocolate and wrapped it up in luxurious 23 carat edible gold. The unique ultra-luxurious dessert boasts of edible gold sheets, Doves organic flour sourced from the United Kingdom, Rachel’s organic butter, Premium Amedie Porcelena cocoa shipped from Italy and gold Ugandan superior quality vanilla beans. Apparently the innovative discovery has been the brainchild of Shafeena Yusuff Ali, the founder of Bloomsbury cupcake. Shafeena collaborated with the staff of the most fashionable bakery in the Gulf city to help bring in the flavor and taste of London to Dubai. To fulfill her intention of preparing the most expensive cupcake in the world, Ali reportedly spent several weeks studying its recipe in order to provide it with just the perfect taste. The décor of the cupcake perfectly complements its five most expensive ingredients. Coincidentally with the launch of the most expensive cupcake, the brand also marks its first anniversary. The store opened its doors to food enthusiasts last year.